And on the seeds I sow. To make my garden grow." And now for the ingrediente segreto, Strega Nona blew three kisses to the moon. With the aid of her helper Big Anthony and Bambalona, the baker's daughter, Strega Nona has planted her carefully saved seeds--pisello (peas), faglioli (beans), zucchino (zucchini), and the rest--but as she calls on the full moon for help, Big Anthony, always on the lookout for a bit of magic of his own, is secretly listening in. While Strega Nona happily tills her tidily laid out garden through the growing season, her helper Big Anthony gathers some accidentally dropped seeds and plants them haphazardly in his hidden garden spot, hoping to impress the bossy Bambalona with his prowess. Scrupulously, he repeats Strega Nona's little song, this time blowing three extra kisses to the full moon for good measure. Strega Nona's arrow-straight rows yield a molto bene harvest, which she carefully lays up for the winter, while Anthony's jumble of jungle-like growth also produces a prodigious output. "Mamma Mia!" thought Big Anthony. "I can't let Bambalona or Strega Nona see this mess!" Soon offerings of harvest vegetables begin to appear mysteriously each morning outside Strega Nona's door. Bewildered, Strega Nona carries the donations inside, until her small cottage becomes crowded by eggplants, zucchinis, beans, and pumpkins. "Santo Cristo! If this keeps up, I won't have room to sleep in my little bed," worries Strega Nona. The generous good witch packs her basket full of the bounty and sets off for the convent in the village below, where she finds out that the sisters of the convent and the villagers have been beset with a strange over-abundance of rainfall which hampered their harvest. "Oh, grazie, Strega Nona" said the mother superior. "You must have heard our prayers. Our gardens didn't do well this season. In fact, no one's garden in the village did. We had too much rain down here, while you had lots of sun on your hill." The mayor convenes the village for a welcome harvest feast, and Strega Nona unloads her surplus upon the grateful townspeople and with relief makes her way back up the long hill to her now pleasantly roomy cottage. But that very night, by the light of the moon, we see the shadowy figure of Big Anthony, clandestinely delivering three more huge pumpkins to Strega Nona's doorstep. 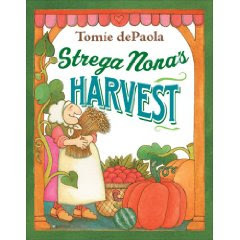 Caldecott Award-winning author-illustrator Tomie dePaola has another winning entry in his long-running and occasionally best-selling series (see his amazing Brava, Strega Nona! : A Heartwarming Pop-Up Book), in his latest, Strega Nona's Harvest (G.P. Putnam's Sons, 2009). The gentle theme of generosity and sharing is nicely set off by dePaola's funny and familiar characters and its setting in that warm and neighborly Calabrian village in Italy.